Barack Obama: Take China �to the mat� about currency manipulation. Hillary Clinton: Bush defanged the Consumer Product Safety Commission. Hillary Clinton: FactCheck: Yes, Bush shrunk CPSC; but it shrank before Bush. John Edwards: Trade policy caters to interests of big corporate America. John Edwards: Corporate interests have taken over democracy. Chris Dodd: Education is the heart of who we are. Barack Obama: Aggressively address accelerating climate change. Joe Biden: FactCheck: Oil did not jump $18/bbl due to Iran Resolution. Chris Dodd: Country-of-origin & ingredient labeling for food imports. Hillary Clinton: Better track kids� products for exposures to toxic materials. Chris Dodd: Gold medal to Tibetan Dalai Lama sends strong message. Hillary Clinton: China respects us if we call them on human rights breaches. Hillary Clinton: Deeply involved with Bill Clinton�s foreign policy team. Hillary Clinton: Operate from a position of strength, but not confrontation. Hillary Clinton: FactCheck: Chinese did black out Hillary, but DID invite her. Joe Biden: Hold China accountable; it�s capitulation, not competition. Mike Gravel: With policy of �beggar thy neighbor,� we all become beggars. Joe Biden: Toughest choice: rationalizing competition & trade policy. Barack Obama: Restore habeas corpus to reach Muslims abroad. Barack Obama: Illegals shouldn�t work; but should have path to citizenship. Barack Obama: Don�t deputize Americans to turn in illegal immigrants. Barack Obama: OK to provide government services in Spanish. Chris Dodd: Hold employers accountable for knowingly hiring illegals. Dennis Kucinich: No vigilantism & no sending illegals home willy-nilly. Dennis Kucinich: Encourage the American people to reach out; learn languages. Hillary Clinton: English unifies us; teach ESL but support other languages. Joe Biden: H1-B visas only for jobs Americans can�t do. Joe Biden: FactCheck: 67% of illegal aliens speak Spanish; not 40%. John Edwards: Loss of middle-class jobs drives down wages, not immigrants. John Edwards: No short-term solution; need comprehensive reform. John Edwards: H1-B visas only for jobs Americans can�t do. Mike Gravel: We�re making a mountain out of a mole hill on immigration. John Edwards: Trade policy should look out for manufacturing jobs. Dennis Kucinich: I�ve been right all along on Iraq, Iran, & healthcare. 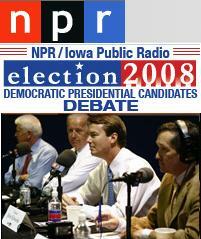 The above quotations are from 2007 National Public Radio Presidential Debate for the Democratic candidates, at the Iowa State Historical and was co-sponsored by Iowa Public Radio, moderated by Steve Inskeep, Michele Norris, and Robert Siegel; Dec. 4, 2007.